​NO plastic grocery bags, plastic food bags, sandwich/zip lock bags, cling or saran wrap, etc. ​Read More regarding the changes to plastic film here. There is a blue recycling bin at the Landfill for recycling paper, cardboard, beverage containers, plastic jugs, bottles, and food containers. No glass bottles or jars will be accepted. 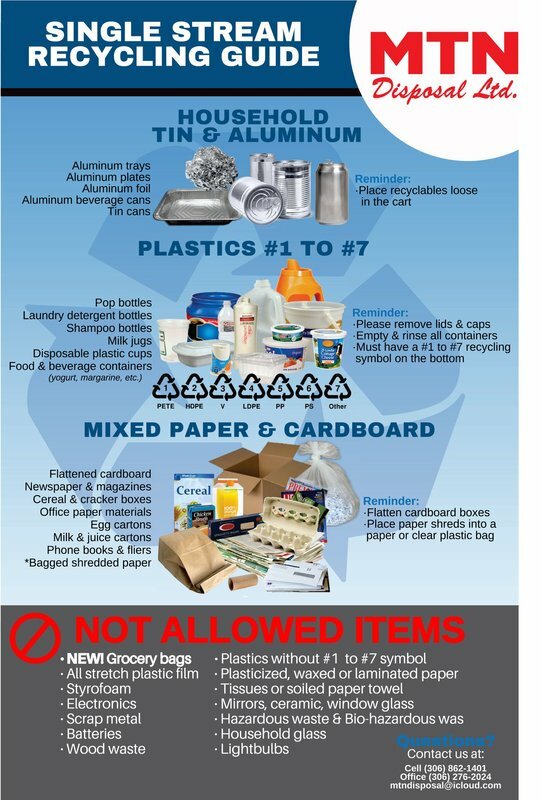 Ratepayer's can now also drop off recycling at the RM blue recycling bin located at 307 Railway Avenue in White Fox, at the blue recycling bin located on 1st Street W in Choiceland (across from the Co-op grocery), at Pruden's Point and at the landfill. As of April 1, 2017 milk containers will be available for refund at SARCAN. Click here for SARCAN's full website. Used Oil can be taken to the below locations to be recycled. Call ahead before you go. Mardell's Fix-It: 306-428-2241- Please empty the pails into the tank provided and remove the lids from the pails. Grain bag recycling is available at NW 06-52-16 W2. To get to this location drive 1 mile West of Garrick then 1 mile South, there are signs along the highway where to turn. Grain bags will not be accepted at the landfill or in the blue bins; they will only be accepted at the designated location. There is a sign with instructions on it at the site. Grain bags cannot be recycled unless rolled. Having a grain bag roller makes consolidation of the plastic easier and more convenient, especially in the winter when snow and ice make it difficult to remove it from the field. A government program is currently offering a rebate up to 50% for purchasing grain bag rollers. Grain bags must be well secured with multiple wraps of twine. Both the rolling and the tying make it easier for the bags to be shipped to the recycler. If they are not adequately rolled and wrapped they will not be shipped. This site is also accepting twine for recycling. Collection bags can be picked up free of charge at the RM office or tote bags or super sacks may be used. The twine must have less than 10% contamination by weight and must be kept separate from net wrap. For a full listing of agricultural plastics recycling across the province, click here. Simply Ag Solutions Inc is holding a fundraiser for student groups interested in collecting twine. This fundraiser is open to any student group that wishes to participate, such as a 4H group. Simply Ag Solutions Inc will pay $0.10/lb for any twine dropped off (weighed) at the collection site. Twine should be dry and free of debris (contain less than 10% hay/straw/manure).